Ceramic traditions vary greatly around the world. In some cultures, the material is considered all-important, while in other cultures, the form or shape is the emphasis. Techniques for production of ceramics vary as well, though there are basic techniques such as coil-built, slab-built, or wheel thrown that are universal. What I always enjoy discovering is the sharing of ceramic traditions across cultures, and sometimes how easily they meld. This is the story of a traditionally trained Japanese ceramic artist who joined a rich historic ceramic tradition in the United States. Native bands such as the Cherokee and Catawba in western North Carolina had ceramic traditions the extended well before the arrival of white settlers, primarily pit-fired wares. European potters began establishing kilns in the state in the early 1700s, the British in the eastern part of the state and the Moravians in the Winston-Salem area. The earliest wares were earthenware and stoneware produced from North Carolina clay. By 1850, Randolph County was the center of salt-glazed stoneware, while Lincoln County produced alkaline-glazed stoneware. The tradition of these native wares endures to the present day. North Carolina has become an important American center of ceramic art, with over 500 full-time ceramic artists living and producing in the state. 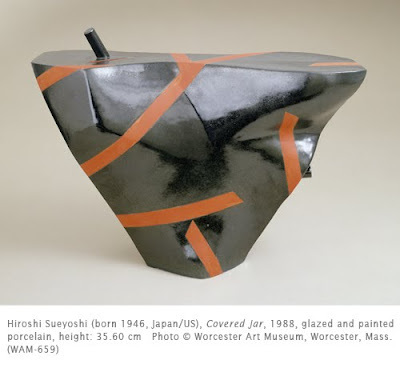 Hiroshi Sueyoshi, a native of Tokyo, was apprenticed as a ceramicist in 1968. He studied at Tokyo Aeronautical College and Ochanomizu Design Academy. He came to the US in 1971 to help design and build Humble Mill Pottery in Asheboro. He continued his studies and work in Virginia, returning to North Carolina in 1973. When he first returned to the state, he worked as a production ceramic artist, producing cups and saucers, bowls, and plates, being paid fifteen cents for every pound of clay made into the vessel. He worked for Seagrove Pottery and Teak’s Pottery as a production ceramicist, and later as a pottery instructor at Sampson Community College in Clinton. He now lives in Wilmington where he is the artist in residence at the Cameron Art Museum. While he works with the native blue clays of southeastern North Carolina, he also produces pieces in the traditional Japanese medium of porcelain, like this work. While bowls and jars are still his main interest, he has branched out into figurative work as well. One of his sculptures is outdoors at the Airlie Gardens Minnie Evans Sculpture Garden. The tribute to the African-American artist who worked as a ticket-taker at Airlie Gardens contains a portrait of her. This jar was produced in the nerikomi technique, laminating colored clays into blocks with carefully controlled pattern developed through cutting, folding, and reforming the layers clays. In 2006 Hiroshi was named a North Carolina Living Treasure. Beautiful beautiful contemporary traditional work. Thank you for posting about these incredible techniques.